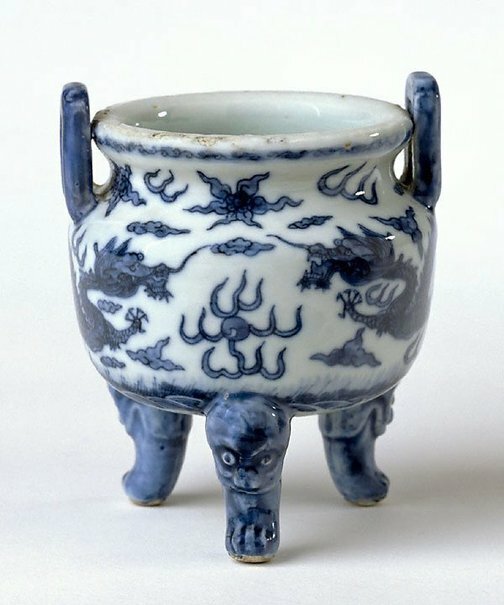 This incense burner is decorated with two five-clawed dragons frolicking with a flaming pearl amongst clouds and flames, beneath a narrow scroll border and above a wave base. The three legs bear animal faces above beast claws. The design is based on a legend of the dragon having nine sons which emerged in the Ming dynasty. One of the nine sons is named Suanni who resembles a lion and enjoys smoke, and thus appears often as a motif on incense burners.